Since the World Series is over, I decided it was time for a new poll to be introduced. Sorry to say, but no one got the poll correct! It is ok, because I did not even put up that the White Sox would win the series as an option! But now this should be an interesting poll, so definetly check it out and vote! I also put in links to www.majorjleaguebaseball.com and foxsports.com on my links side, so go look at it and check out whats going on in baseball around the country and what is happening in other sports! Two major things happened in the Yankees orgainization since I just posted yesterday! It is confirmed that Larry Bowa will be the third base coach of the Yankees, and my favorite player Derek Jeter won his second straight Gold Glove! Last year, he was the first Yankee to win it at short stop, giving the Bombers a gold glove at every position in their history. Impressive, huh?! The Gold Glove award is given to the best fielders at each position. Here, you can read the full article. Just one more comment about the Gold Glove is that my other favorite Yankee, Don Mattingly, is the leader for the Yanks with Gold Gloves with an impressive 10 at first base! Larry Bowa will definitely be a benefit to the Yankees this season because of his experience. How many years did he sign for? I didn't even see on espn that he had signed with New York. Jeter is a solid player and probably deserved to win a gold glove because he is such a solid player and a born leader. I just find it odd that the argument could be made that he may not be the best shortstop on his team? 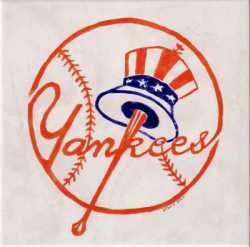 Arod would give Jeter all he could handle if he was still playing shortstop for any other team in the American League. Congrats to Jeter regardless and we'll see what Bowa can do for the team. Congrats on your new and improved blog. I took some notes and I may have to make some adjustments to mine as well. Anyway, I had the distinct honor of being the first one to take your poll. I selected Ken Griffey, Jr. as the centerfielder for the 2006 season. The Yankees have a habit of going out and getting big names in the off season, so I would not be surprised to see him in pinstripes next season. As far as Larry Bowa, like I said before, I don't think you will be disappointed. He's a great baseball guy and I think he will be beneficial at third base coach. In regards to Derek Jeter, what do you think the chances are that he passes Don Mattingly as the Yankee leader in Gold Gloves? Personally, I don't think it is realistic; seeing as Jeter would have to run off eight consecutive seasons winning the award. I don't even know if he has eight more seasons in him. But, we shall see. Your blog looks awesome. I really like the way you show all your comments. I am probably going to copy your stlye on my blog. Interesting to hear about Larry Bowa as a new Yankees coach. I also think I heard that Ron Guidry has been signed as the Bombers new pitching coach. I am not sure, but I think that Guidry used to be a pitcher for the Yanks. I know the organization likes to bring back former players as coaches. They have done so with Don Mattingly, Willie Randolph, Joe Girardi, and Louis Sojo in the past. That is awesome that Jeter won a Gold Glove. No other Yankees won Gold Gloves? Also, did Robinson Cano win Rookie of the Year or has that not been decided yet? The blog looks good, and its easy to see you're doing a great job with it. I agree with having nothing to worry about in regards to the hiring of Larry Bowa. He's a knowledgable baseball mind and will be able to contribute a lot to the team. I think this was a smart move and will do nothing but good things for the future of the organization. Let's give it up for the captain of the team for his gold glove. It is a huge honor, especially with all of the great short stops in the American League. I also feel that it is fitting that Jeter was the first Yankee to win the award at short stop because of all that he has done in his career so far. I'm also glad to see that Cashman is going to remain at the helm of this organization. He has made almost all good decisions regarding the team, and I feel we would have been stepping back had he not been resigned.